Designed to take photos at a 90 degree angle, this device attaches to your phone for creative shooting. Up your photography game with this low profile lens that magnetically attaches to your phone. 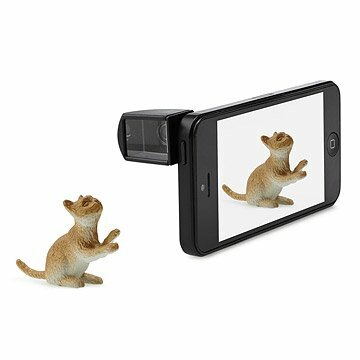 Designed to capture photos at a 90 degree angle, this device simply attaches to your phone's lens to act as a periscope for creative shooting. With the ability to swivel the lens 365 degrees, you can lay your phone down flat in "texting position" and still shoot straight ahead, turning any surface into an impromptu tripod. Perfect for candids of your friends, getting that social media-worthy shot of a gourmet meal, or when you need a little photographic evidence to back up an unbelievable story. Made in China. Compatible with: iPhones, iPads, Android phones. Grab a ring & peel off sticky backing. Place the ring over your phone's lens. Hold firmly for one minute, then allow to set for a half hour. The lens will now magnetically attach to the ring. Now take some pictures! I bought 5 of these for my nieces and nephews...they are all under 10 y/o and all had iPad/iphone covers on their phones (obviously bc they are kids). The concept of this is great, and when it actually sticks on it's great for them to use. But makes you nervous when you have to take the massive case off the kids iPad for them to run around and take photos. Also, we had issues with the magnetizing piece/sticky piece sticking to the iPad itself. It continued to slide off. I wish I just got them all different gifts. Product has not been used yet. Would have liked to have just a little instructional insert. Product arrived in a timely manner in good condition. Gave it to our 14 year old for Christmas and he loves it. Fun to sneak up on pets! Gave it to granddaughter at Xmas - no info, no instructions. found and attached one ring to camera piece because it said attach and let it dry 24 hours. Which meant it could not be used right away. It did not say that the ring needed to be attached to the smart phone as well - so once I send my granddaughter this info - have to wait another 24 hours. So we do not know if it works or how well. Purchased these for my teen granddaughters' phones. There were no instructions for attaching the lens. There were three tiny rings with glue on one side that were magnetized but nothing about how many to use, how to place them, etc....nothing. Very disappointed. Fun gift for my almost teen boy. A little harder to use if the phone has a cover. Unique way to take photos. I love the candid shots of my friends and family that I'm able to get with this lens! It's user friendly, lightweight, and fun!